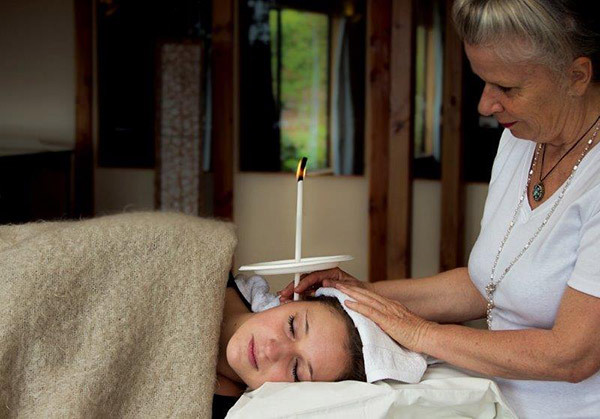 Ear candling has been practiced for centuries. The ancient Egyptians, Chinese and North American Indians have all ear candled over the years, with the American Indians using it as a form of meditation. Today ear candling is used to help remove ear wax, give relief from headaches and migraines, glue ear as well as allergies, swimmer's ear, head colds, sinus problems, hay fever as well as whole-body relaxation. Using the hollow cotton and bee wax ear candle you - the client - lay fully clothed on your side upon the massage table. With the area around your ear covered with a light weight cloth, the candle is lit and the other end is placed gently in the ear, without applying any pressure. Throughout the procedure the candle is held. Slowly as the candle burns down, the warmth from the inside of the candle is what draws out the wax and helps to evaporate moisture. This is a very relaxing procedure to the point clients often say they could fall to sleep. Once the first ear has been candled, you'll turn over and the procedure is repeated in the other ear. How long does ear candling take? Each ear takes approximately 20 minutes to candle. To extend the benefits of the candling, a gentle massage working with the acupressure points of the face to stimulate the Lymphatic system follows. This massage generally lasts 15-20 minutes. Candling is safe for toddlers through to the elderly. Please note ear candling is not recommended for those with perforated ears or children with grommets in place. Please wait until the grommets have fallen out before ear candling.